The forward-thinking business owner is always looking for ways to trim expenses, and although lighting very rarely comes to mind, even in the modern, go-green world of today, it is an essential consideration as a long-term investment that can save huge sums of money in the long run. LED Bulbs do not need to be replaced as often. With guarantees of 10-15 years of operation, consumers are finding that their LED bulbs are often surpassing even those lofty promises, meaning you'll save $1-$2 per bulb every other year to replace those incandescent bulbs. 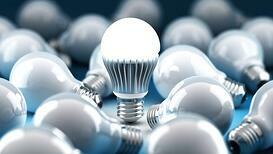 LED Bulbs consume less energy. LED bulbs use between 100 times less energy compared to a standard incandescent bulb and 20-50 times less energy than even the most efficient fluorescent bulbs. LED Bulbs are more resilient. Hard-packed incandescent bulbs can't withstand extreme changes in heat and are very susceptible to shock damage due to the delicate nature of the filament, however, they produce the very heat that causes damage to themselves. LED Bulbs produce almost no heat whatsoever, and because of the solid state nature of LEDs, they are resistant to shock damage too. Fluorescent bulbs require a vacuum-sealed chamber filled with inert gas to function properly. But that gas can leak out even if there aren't any holes in the glass, the glass itself is just too porous like a balloon filled with helium. And when it does, the ballast that activates the gas has to work harder to establish a current. LEDs don't need a perfect vacuum to operate, they're contained on metallic slivers at the core of the bulb. So, yes, it can cost more to replace your incandescent and fluorescent bulbs with LEDs, sometimes as much as 10 times the cost per bulb (comparing a $2 incandescent with a $15 LED), but consider that you'd have to replace the incandescent 7-8 times over the life of the LED, assuming no damage or over-working of the bulbs, and you've already saved $3 not even factoring in the savings in energy efficiency over those years which can be as high as $30-$50 per bulb. For more information on upgrading to LED lighting, emergency lighting installation, or on-call electrical repairs, contact us today. To find out more of the benefits of upgrading to LED lighting, check out our blog!